WattHead - Energy News and Commentary: Bush Highlights Energy in State of the Union Address - Admits "America is addicted to oil"
Bush Highlights Energy in State of the Union Address - Admits "America is addicted to oil"
President Bush delivered his annual State of the Union Address this week [full text here]. A full four paragraphs and a whole 2 minutes and 15 seconds were devoted to discussing his energy policy proposals during which he openly recognized that "America is addicted to oil, which is often imported from unstable parts of the world." To address this issue, Bush proposed that the United States cut its oil imports from the Middle East by 75% by the year 2025. Announcing that "the best way to break this addiction is through technology," Bush used the speech to announce a new Advanced Energy Initiative - a 22 percent increase in clean-energy research. President Bush called for innovation in two key areas: energy generation and transporation. To address the former, Bush proposed increased investment "in zero-emission coal-fired plants, revolutionary solar and wind technologies, and clean, safe nuclear energy." To address transporation, the President called for increased "research in better batteries for hybrid and electric cars, and in pollution-free cars that run on hydrogen" as well as cellulosic ethanol. Bush called for "additional research in cutting-edge methods of producing ethanol, not just from corn, but from wood chips and stalks, or switch grass" and announced that it was his goal "to make this new kind of ethanol practical and competitive within six years." At first glance, this almost looks like leadership on energy policy finally coming from the federal government ... almost. Upon closer examination, however, Bush's new 'ambitious' Advanced Energy Initaitive isn't quite as exciting as you might have hoped. First off, is a 75% reduction in imported oil from the Middle East really that bold a goal? In actuality, only 2 million barrels per day (bbl/d) or about 16% of the aproximately 12 million bbl/d of oil imported to the United States comes from the Middle East (the bulk actually comes from Canada, Mexico and Venezuela). So a 75% reduction in Middle Eastern oil only amounts to a 12% reduction in oil imports or about 1.5 million bbl/d. It amounts to an even smaller chunk of our total oil consumption, currently at just over 20 million bbl/d. At that level of oil thirst, Bush's '75%' figure amounts to just 7.5% of total oil consumption. That's hardly a bold "move beyond a petroleum-based economy." Now, don't get me wrong, 7.5% isn't nothing. It's at least moving in the right direction - our current course of (in)action has us heading towards an increase in oil consumption by 2025, not a decrease. Of course, 7.5% doesn't really compare to the full potential of some of the technologies Bush mentioned in his address, including cellulosic ethanol and biofuels, plug-in hybrids and electric vehicles (and simple fuel efficiency which was conspicuously absent from Bush's speech). Additionally, specifying a 75% reduction in imports of Middle Eastern oil leaves the door open to simply shifting the imports to other countries so there's no guarantee we'll even see that 7.5% reduction in oil use. Of course, considering Peak Oil, we may not even be able to buy those 1.5 million bbl/d from the Middle East by 2025 anyway. As Byron King wrote for the Energy Bulletin, that 75% 'goal' may actually be more of a prophecy. Referencing Peak Oil concerns, King writes, "There is no way that the US will be importing as much oil from the Mideast in 2025 as it imports today. And there is no way that the nations of the Mideast will be exporting as much oil in 2025 as they are exporting today." Considering recent news about half of Kuwait's oil reserves 'vanishing' overnight and the prize oil fields of Middle Eastern nations reaching peak production, King may not be too far off. 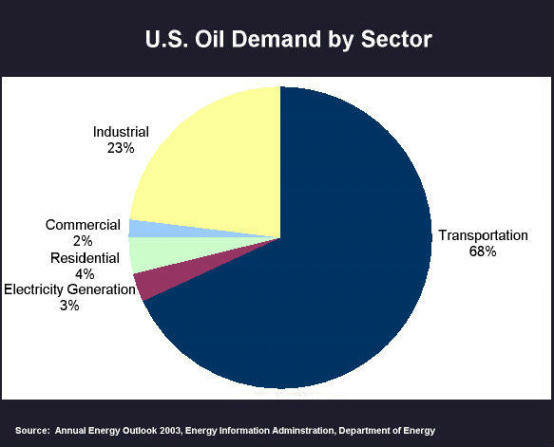 Interestingly enough, there was no mention of Peak Oil in Bush's address. Also, if reducing oil imports is our goal, then where was the mention of a gas tax - probably the most effective way to encourage conservation and efficiency. Of course conservation and efficiency - almost always the most cost effective and easy to implement solutions to reducing consumption - weren't mentioned either. So what policy action is Mr. Bush proposing to achieve his 'bold' vision to "move [us] beyond a petroleum-based economy"? The short answer is, the Advanced Energy Initiative (AEI), a 22% increase in Deparment of Energy funding for a variety of clean energy generation and alternative transport fuel research programs. $150 million—a $59-million increase (65%) over FY06—for the Biorefinery Initiative, the purpose of which is to help develop bio-based transportation fuels from agricultural waste products, such as wood chips, stalks, or switch grass. $30 million—an increase of $6.7 million (29%) over FY06—to speed up battery development for hybrids and plug-in hybrids. $289 million—an increase of $53 million (22%) over FY06—to accelerate the development of hydrogen fuel cells and hydrogen-powered cars. $281 million for the development of clean coal technologies. The President had committed $2 billion over 10 years to speed up research in the use of clean coal for power generation. The 2007 Budget request will nearly complete that $2-billion promise 4 years ahead of schedule, according to the White House. $148 million for a new Solar America Initiative—an increase of $65 million (78%) over FY06—to accelerate the development of solar photovoltaic cells. $44 million for wind energy research—a $5-million increase (13%) over FY06 levels. So what do we have here? First, I'd like to point out that this is one of the first mentions in a major policy address by the president or anyone amongst the Republican leadership that I am aware of that highlights cellulosic ethanol and plug-in hybrids and electric vehicles, perhaps the most promising short to midterm solutions to our oil addiction. However, let's look how the funding breaks down to see where the priorities of this initiative lie: on the alternative fuels end of things, hydrogen gets twice as much dough as biofuels and ten times as much funding as advanced battery research despite the fact that a commercializable hydrogen vehicle, much less the infrastructure to fuel it is still decades away. And on the electricity generation end of things, clean coal (including the FutureGen project) gets twice as much funding as solar research and nearly seven times more funding than wind. Now one might argue that because wind, solar, biofuels and batteries are such viable near term alternatives, they deserve less funding. We ought to put our research dollars to work on those technologies, like hydrogen, that still need a lot of work. Furthermore, unlike hydrogen, clean coal is not some far off technology. In fact, if you glance over at the Energy Blog's coal archives, you'll quickly recognize that clean coal - or Intergrated Gasification Combined Cycle - is already undergoing commercialization, despite the fact that the DOE's FutureGen 'demonstration' project is still years away from completion. Coal gasification and carbon sequestration are both relatively mature technologies - the former being invented by Germany to fuel the war effort during WWII and the later being used by the oil industry to increase output from declining oil fields (they call it enhanced oil recover or EOR). Compare this to the solar industry which is currently working hard on a number of potentially revolutionary solar technologies including silicon-free thin-film PVs, solar concentrators, organic PVs and nano-scale engineering like quantum-dots. Each of these technologies offers to bring to price of solar power down into a competitive range and could further the dream of ubiquitous distributed solar power. Shouldn't we be focusing our attention on these technologies then? Let's pump funding into the most promising new solar technologies and help bring them to market faster. The same goes for advanced battery technology as compared to hydrogen. Battery tech is right on the cusp of developing to the point where full electric vehicles and certainly plug-in hybrids are viable. Shouldn't we focus our attention on brining these technologies, which only recieved an additional $6.7 million as part of the AEI to market quickly, rather then funneling almost ten times that much money into hydrogen research. The budget cuts came as part of the 'defecit reduction' budget cut measures passed by Congress at President Bush's urging (meanwhile, Bush continues to call for increased tax cuts and lobby against letting his existing tax cuts expire ... gosh, it certainly makes sense to me to lower taxes while trying to cut the deficit and while waging a war in the Middle East costing hundreds of billion of dollars, not to mention the unending 'War on Terror'). So, Mr. Bush, how much of this new bold Advanced Energy Initiative is simply restoring things to the way things were before you axed the budgets of our nation's best alernative energy research centers? While I have to be happy that President Bush is at least undoing some of the budget cuts he has already made to alternative energy research and perhaps even added some dough to the pot, there's no reason why anyone truly interesting in seeing a sustainable energy future should be satisfied by the president's speech. His goals - what a mounts to a 7.5% reduction in total oil consumption - and his methods - a 22% increased in alternative energy spending, part of which merely undoes previous DOE budget cuts - are hardly 'ambituous' or 'bold' as Mr. Bush's political strategists might want us to think. where is the truly bold call for a 50% reduction in foreign oil by 2025, rather than a 12% reduction (i.e. 75% of Middle Eastern oil) that could simply be shifted to imports from other non-Middle Eastern nations? In short, where is your bold energy plan for the future, President Bush? This certainly isn't it! I am glad that you did this (even a few days delayed). I see this initiative in a whole new light now. It is completely hollow. I believe that Peak Oil and high energy prices are now upon us and that we will be forced to do something more than this. Jigar brings up another excellent point that I overlooked. President Bush has promised to make regulation and permitting easier for the nuclear, coal and oil refinery industries, but has done little to break down similar barriers for the wind and solar industries. Another clear indication of exactly where Mr. Bush's priorities really lie. Don't worry about the delay. One of the things I like about blogs is that one doesn't have to be so slavish about reporting "news", ie what happened during the last 24 hours. In-depth analysis takes time.